You guys have all heard of the Rubber Duck project by now, right? It’s this series of 40 foot tall floating sculptures that have been cropped up on the shores of Amsterdam, Osaka, Sydney, Sao Paulo, and Hong Kong since 2007 or so. Now it’s making it’s way up the Allegheny river in Pittsburgh. No one is safe from the horror. Oh, sure, the official story is that the duck is part of an art project by Florentijn Hofman, who views the sculpture as a “global ambassador” thatcan spread the message of water conservation and ocean protection in cities all over the world. But we know it must be hiding something vile and sinister underneath all that joy and happiness. 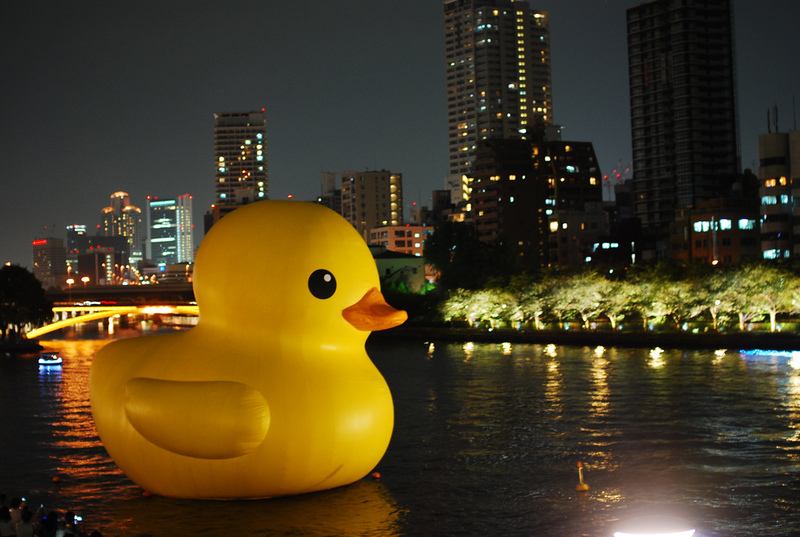 In all seriousness, Wired reports that the duck really is pretty surreal to look at. You know, in the cutest way possible. One Pittsburgh resident, Jim Baur, is quoted as saying, “You couldn’t help but stare at the duck, if nothing else but to try to continually reassure your brain that yes, in fact, there is a 40′ rubber ducky floating in the river.” No, Jim! That’s what the duck wants! Do not succumb to its cold black eyes! Resist its terrible gaze! Er, did we say terrible? We meant adorable. Yeah.